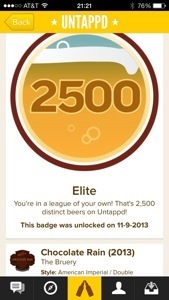 A Toast and Congratulations to @KnoxBeerCrew’s @MattCrowell on his @Untappd Eliteness! My friend and Knox Beer Crew Founder Matt Crowell has just hit a big milestone in his craft beer drinking. He has just checked in to his 2500th unique beer on Untappd! I met Matt a couple of years ago through social media. Around that same time I started using Untappd. For those of you that don’t know what that is, I forgive you. Not everyone is a social media user, has a smart phone or cares to keep track of their drinking. I heard all the arguments against using Untappd from “The cops can just look to see what you’ve been drinking if you get pulled over” to “I don’t support the gamification of craft beer culture”. I have nothing against people that feel this way. Hell, my good buddy and assistant brewer Todd drinks as much (if not more) craft beer of anyone I know and he doesn’t use it. However, for myself and many of my other friends, it’s very integrated into our every day lives. I’ve met some great people (and my girlfiend, ex-girlfriend Katie because of this app. I first met Matt Crowell at Bearden Beer Market. I’m hoping I’m remembering this right. I use to be a Four Square fiend, checking in to as many places as many times as possible. One evening I checked in at BBM. Matt happened to be there, asked if I was Ratchet and we hit it off right away. It’s always great to meet other like-minded craft beer lovers. We became friends on twitter and starting using the hash tag #KnoxBeer. We scheduled a tweet up one day at the Downtown Grill and Brewery using that hash tag. It soon morphed into #KnoxBeerCrew and was used whenever our growing group of friends wanted to meet for a drink. Common tweets would be something along the lines of “Anyone from #KnoxBeerCrew going to BBM tonight?” or “Hey #KnoxBeerCrew (some beer store) just got in (blank). We made plans and scheduled a tasting for all of us. From these initial meetings, Matt hatched a plan. Being a web designer on the side, he put everything together and founded the Knox Beer Crew website. This online home for Knoxville Craft Beer has become the main tool that has unified our small but growing craft beer scene. Once it was up and running, we all quickly made profiles and added our input. Monthly tastings were scheduled as a way to meet and enjoy rare beers not usually available in this area. Matt was an early adapter of Untappd. When I describe Untappd to people unfamiliar with it, I always describe it as a cross between twitter, facebook and four square for beer geeks. You can rate the beers you drink, leave comments, take pictures and link it to your other social media apps. It encourages check-ins by allowing you to earn a number of cool badges for consuming beers, meads, and ciders with a variety of different criteria. An example of the different level of badges can be found here. Currently, the highest badge available for the amount of unique check-ins is the Elite. This is the badge Matt Crowell just earned. That’s 2500 unique beers. Some of these were full pours; some of these were sips. Either way, that’s a whole lot of beer sampled over the last 3 years. Tracking down that many uniques takes a whole lot of dedication and perseverance. Matt is the first person I know personally to reach this milestone. Maybe as Untappd grows over the years, they’ll add another level. If they do, I’m sure he’ll hit it before anyone else in our scene. So Congratulations Matt, I raise my glass and toast to you! Let’s get together soon and pop some bottle caps. The crew who made it out this time: Curtis, Jeannie, Matt C., Dan, Matt, Ratchet, Adam, Jason, Animal, Shawn, Nick, Mark. Knox Beer Crew ready to fly. From left to right, Mark, Matt, Jason, Nick and Ratchet. #GABF is the twitter hashtag for this event. The ride to Kevin’s. Cheers! Task master Matt keeping us on track. He said “no pictures.” so I snapped one because my phone was in my hand and I could. This entry was posted on Saturday, November 9th, 2013 at 21:42 and is filed under Craft Beer in Knoxville, Knox Beer Crew, Knoxville beer blog, Knoxville beer scene, Social Media, Uncategorized, Untappd. You can follow any responses to this entry through the RSS 2.0 feed. You can leave a response, or trackback from your own site.